If you want to save energy, it’s best to start with your thermostat – a device that controls half of your energy bill. According to Natural Resources Canada, a huge chunk of the average Canadian home’s energy bill goes to space heating (63%) and space cooling (1%). 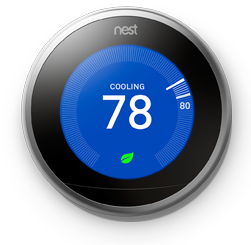 Considering the Nest Learning Thermostat to save energy is a step in the right direction as this device controls your home’s cooling and heating systems. Two independent studies, one conducted in Oregon by the Energy Trust and another study conducted in Indiana by Vectren Energy, showed that the Nest Learning Thermostat can save up to 12% of heating usage and about 15% of cooling usage in homes with central air conditioning. In the Oregon study, Energy Trust had a contractor install Nest Learning Thermostats in 185 homes heated by heat pumps. Energy Trust then hired an independent firm to analyze the changes in the energy bills and to also ask participants about their experiences with the Nest Learning Thermostats. The Oregon study found that the Nest Learning Thermostat users saved an average of 12% in electric heating usage, equivalent to 781 kWh per year for each home. 66% of the Oregon study participants also reported feeling more comfortable after the Nest Learning Thermostat was installed in their home. In the Indiana study, Vectren Energy had 300 Nest Learning Thermostats installed in homes and then hired an independent group to evaluate the results. The study showed that the Nest Learning Thermostat users had an average natural gas savings of 69 therms per year, equivalent to 12.5% of savings in heating usage. The same study also found that the Nest Learning Thermostat users had an average electricity savings of 429 kWh per year, equivalent to 13.9% savings of cooling usage. Nest conducted a study of their own based on energy bills of their actual customers in 41 states in the U.S., before and after they had the Nest Thermostat installed. The study showed that on average the Nest Thermostat saved 10% to 12% on heating and 15% on cooling. The estimated average savings on heating and cooling systems, as a result of using Nest Thermostat, is $131 to $145 a year. Therefore, the Nest Thermostat essentially pays for itself in two years. Since thermostat use differs based upon personal preference, the characteristics of various homes, the number of occupants in the home, the type of heating and cooling equipment and climate, your energy savings could be higher or lower than the average savings. In February 2017, the Nest Thermostat became the first thermostat to receive the ENERGY STAR certification from the U. S. Environmental Protection Agency (EPA). Natural Resources Canada promotes products that have an ENERGY STAR certification by the EPA. Nest estimated that the Nest Learning Thermostat saved 21,131,543 kWh of energy in homes from 2011 to March 23, 2018. Nest’s calculation is based on the amount of energy their customers would have used if they hadn’t purchased a Nest Thermostat and just left their old programmable thermostats at a constant temperature. Prior to the Nest Learning Thermostat launching, programmable thermostats were the norm – a type of thermostat where you have to manually change the temperature in order for it to rise or fall. Most people find these programmable thermostats bothersome and complicated and many don’t even bother to alter the temperature, resulting in wasted energy. In order for the Nest Thermostat to learn from you, begin by using it as a programmable thermostat – turning it up or down to your desired temperature at any particular time of the day – for one week. Your Nest Thermostat will then create a personalized schedule for you based on your temperature preferences for the whole week. Nest Thermostat learns from your home by analyzing how your home heats or cools, as no two homes are the same. It saves energy by turning itself down when you leave the house. Follow the leaf feature in your Nest Thermostat monitor. This leaf feature of the Nest learns on its own how to save energy. Control your thermostat from anywhere via your smartphone or tablet using the Nest app. View how much energy you use every day through your smartphone or tablet using the Nest app. Based on your energy history, you can review which days more energy is used and determine how to use less energy. In addition to saving you money, the Nest Thermostat also makes your family and home safe. Your Nest Learning Thermostat connects with your other smart home devices. For instance, your Nest Thermostat connects with your Nest Protect Smoke and Carbon Monoxide Alarm, assuring you that whenever Nest Protect senses carbon monoxide, your Nest Thermostat will automatically turn off your cooling and heating systems since these are known sources of carbon monoxide poisoning. Your Nest Thermostat can also prevent excessive cold and excessive heat in your home as it turns on cooling or heating when set limits are reached. You’ll also be notified via your smartphone or tablet whenever these safety precautions are done by your Nest Thermostat. Connect with us today and save! Are you one of those people who worry if you’ve set the thermostat correctly before you leave? Every NEST thermostat comes with a safety temperature. This safety temperature feature of NEST thermostat prevents your home from extreme temperatures by automatically turning on cooling or heating when the set temperature limits are reached. 1. NEST thermostat ensures that your water pipes don’t burst due to freezing. b) Further ice growth applies dangerously high pressures to a confined water volume. According to the, winter storms which cause pipe freezing account for almost 22% of all homeowners insurance claims in 2013 in the U.S., resulting to $1.9 billion in insured losses and making it as the third largest cause of catastrophe losses, behind only to hurricanes and tornadoes. Money isn’t the only issue in fixing pipes that burst due to freezing. Fixing pipes during winter are often conducted under difficult working conditions and in an atmosphere of urgency. Pipe bursting as a result of pipe freezing can cause serious flooding and structural damage to your home. Molds also start to grow within 24 hours after the pipe bursting, adding damage to your home. If the room temperature dips below the set safety temperature, your NEST thermostat will automatically start heating. You’ll get a notification via your phone or tablet in case the room temperature drops and another notification once the temperature returns to normal level. Notifications about crucial drop of temperature depend on your internet and Wi-Fi connection at home. If your Wi-Fi connection is turned off at the time the temperature drops below the set safety temperature, you won’t be able to receive notifications. Even if your Wi-Fi network is turned off, your NEST thermostat will continue to maintain the set safety temperature. 2. NEST thermostat protects your home and your family from excessive heat. While Canada is considered as the winter capital of the world, summer here can be very hot. Prolong exposure to extreme heat can lead to serious medical conditions like heat exhaustion, heat cramps and heat stroke. “Heat waves can be thought of as ‘silent’ killers because they are not visible like floods, hurricanes, and other weather-related health hazards, and because intense heat can produce effects on vulnerable people quickly and unexpectedly,” the Canadian Environmental Health Atlas said. Every year, nearly 120 heat-related deaths occur in Toronto, 41 in Ottawa and 121 in Montreal according to the Canadian Environmental Health Atlas. Those most vulnerable to overheating are the elderly and small children who are likely to stay inside their homes during the day – the time when the heat is most intense. Because of the vulnerability of these age groups, homes have become a focus for concern for overheating. Homes that are built to prevent heat loss during winter – with improved insulation and airtight construction – may unintentionally increase overheating during the summer months, making the people inside these homes vulnerable. If you’ve got a NEST thermostat at home, in case the temperature goes above the set safety temperature, this smart technology will automatically start cooling. If you’ve Wi-Fi connection, you’ll be able to receive notifications whenever overheating occurs at your home and each time the temperature returns to normal. Your thermostat will automatically normalize your home temperature even if your Wi-Fi network is offline. 3. NEST thermostat can protect your second home, if you have one, from pipe freezing and bursting. Even if no one is occupying your second home, you can sleep tight knowing that your other property is protected from pipe freezing and bursting. 4. NEST thermostat and “NEST Protect” can protect your family from carbon monoxide poisoning. Carbon monoxide exposure at low concentrations can result in fatigue in healthy individuals. At higher concentrations, carbon monoxide can result in impaired coordination and vision, dizziness, heardaches, nausea and confusion. At very high concentrations, carbon monoxide can be fatal. Sources of carbon monoxide include hot water heaters, cars, fireplaces and wood stoves. In Ontario alone, the Canada Safety Council said, that from 2001 to 2007, there have been 74 accidental deaths as a result of carbon monoxide poisoning. In case there’s a carbon monoxide exposure at your home, your NEST Protect – with its industrial-grade carbon monoxide and smoke sensor – can automatically tell your NEST thermostat to turn off the heating system as a precaution. 5. NEST thermostat and “NEST Protect” can protect your family and home from fire. Time is of the essence in fire prevention. According to Underwriters Laboratories, in the 1970s, it would take about 30 minutes for a fire to engulf a room; today it takes only less than 5 minutes. 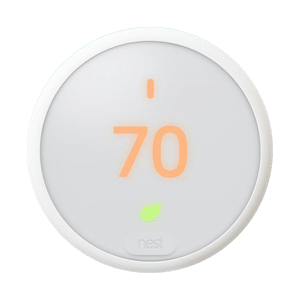 In the same manner that both NEST Protect and NEST thermostat protect your home and family from carbon monoxide exposure, these two NEST products will also protect your family from fire. In the event that your NEST Protect detects smoke at your home, it will automatically communicate with your NEST thermostat to turn off your heating or cooling system. Pipe freezing, excessive heat, carbon monoxide poisoning and fire could damage your home and could cost the lives of your loved ones. But these unfortunate incidents can be prevented. Your NEST thermostat can prevent pipe freezing and excessive heat. And together with NEST Protect, your NEST thermostat can protect your home and loved ones from carbon monoxide poisoning and fire. These smart home solutions will give you peace of mind every time you leave. The dog days of summer are some of the worst! With soaring temperatures and high humidity, staying indoors is often ideal. However, keeping your home cool when it is blistering outside can be hard. Summer means that your home’s air conditioning unit is working hard and long hours. Keeping your home cool doesn’t have to break the bank! Enter smart living. This technology is on the up and up! In fact, by 2020, there will be 50 billion Internet-connected devices. In your home, one of the simplest ways to incorporate smart living is by using a wireless thermostat. Gone are the days of having to be physically at your home to control the temperature! Read on to learn about wireless thermostats and how they can benefit you. What is a wireless thermostat? A wireless thermostat is a device that automates the temperature of your home. These thermostats may also be called WiFi or smart thermostats. These thermostats use sensors that control the HVAC system. Standard thermostats have to be physically adjusted. However, a wireless thermostat can be adjusted from anywhere at anytime. Image setting the temperature of your home while you are hundreds of miles away! In order for this thermostat to work, there must be an available Internet connection. You can remotely turn the system on or off, change the temperature and change the schedule. Wouldn’t it be nice to not have to worry about leaving your AC running when you are away from your home? With a smart thermostat, this is a worry of the past! The ability to adjust your thermostat remotely offers a variety of benefits. Read on to learn how a WiFi thermostat can help save you money! The benefits of smart thermostats are endless. Here are 5 benefits that are sure to wow you. With conventional thermostats, you can only control the system is you are at home. Once you leave for work or go on vacation, the system is inaccessible. A smart thermostat allows you to control your system, no matter where you are! All you need is a WiFi connection and you’re back in control. You can control your air conditioning unit from vacation, while at work, or while you’re outside. Looking for a cool house after spending hours completing yard work? Want to control how often the system runs while you are away on vacation? All of this is possible with a WiFi thermostat! You can control the system from a mobile phone, tablet or any connected device. Do you know just how expensive air conditioning can be? On average, we spend $22 billion each year to run air conditioning in our homes. The costs of keeping a home cool are pricey. The good news? Having control over your thermostat means you have more control over your money! We are all guilty of leaving the system running when we are away from home. But once you lock the door, you have no way to turn the system down. But, with a smart thermostat, you will waste a lot less energy and a lot less money. You can turn off and adjust the system from anywhere. Vacation-mode: activated! This level of control is a true money saver! Of course, a thermostat will monitor the temperature inside of your home. However, a WiFi thermostat also knows how hot or cold it is outside! The ability to monitor outdoor conditions allows you to choose the best temperature for your home. The weather can be unpredictable. The temperature can drop 5 or more degrees in just a few hours. The temperature outside impacts the ideal temperature of your home inside. Ensuring your home remains at a comfortable temperature is a must. No one wants to walk into a home that is too hot or too cold! Going smart and going green typically go hand-in-hand! We can all do a little to decrease our electricity usage. How many times have you left for the day and forgotten to turn off or adjust the temperature on the thermostat? Running your air conditioner can be costly for you and for the environment. The ability to control your thermostat from anywhere means you can lessen the amount of electricity your home uses. With smart thermostats, you can also set power consumption limits. When you near or reach the limit, you can receive an alert. These reports can lead to even more money savings! As with any technology, there are limitations to be aware of. While smart thermostats are ideal for any home, knowing the limitations is ideal. Read on to learn about potential WiFi thermostat limitations. The ability for signals to be transmitted within your home depends on the walls. Block and metal walls can cause interference and reception problems. Ensure your home allows for proper signal transmission. To avoid this issue, do not mount the thermostat on these walls. Also avoid placing the thermostat near other frequencies, such as a microwave. One misconception about wireless thermostats is that they are entirely wireless. These thermostats use the same wired connection as a standard thermostat. The difference is that a smart thermostat can be controlled using a wireless connection. These thermostats also require batteries. Low or dead batteries can cause unpredictable impacts. Be sure the thermostat is properly connected. Also, ensure the thermostat has fully charged and working batteries. The WiFi thermostat making is ever-growing. In fact, there are dozens of wireless thermostats on the market. So how do you know which one to choose? Here are must-haves to look for before purchasing a smart thermostat. The wireless thermostat you choose must be compatible with your existing HVAC system. Before purchasing and installing the thermostat, be sure it works with your system. To determine compatibility, you’ll need to know the type of system your home is fitted with. The thermostat you purchase will indicate the type of system it is compatible with. Look before you buy! The purpose of a WiFi thermostat is that you can control it remotely. Ensure the thermostat you choose allows you to control your home’s system from any mobile device. The thermostat you choose should work on a variety of devices to include smartphones, tablets and laptops. The thermostat should also work no matter if you’re using an Android or iOS operating system. Full mobile compatibility is a must! These features will allow you to get the most out of your smart thermostat. Get the most bang for your buck with these features. Controlling the WiFi thermostat shouldn’t be rocket science. Before purchasing, take a look at the control interface. Is it easy to use? Are you able to navigate around the app? Understanding how to control your smart thermostat is important. Don’t buy before checking out the app interface. You’ll also want to determine how often the app is updated. App updates can impact how well you are able to control the system. Make sure that the company provides routine updates to the app. Looking to incorporate smart technology in your home? Want to know if automated solutions can save you money and reduce energy usage? Tired of spending hundreds of dollars to keep your home livable? If so, Simply Smart Services is the company for you. We offer a variety of smart home automated solutions. Give yourself peace of mind with smart technology. Contact us today to learn how we can improve your heating and cooling system. In Canada, 90% of all residents use a thermostat to help control the temperature throughout their house. Whether you’re obsessed with the latest gadget and want a smart home, or are just interested in trying to find ways to better regulate the temperature in your house, getting smart thermostat is a great option. Here, we’re going to tell you how a smart thermostat works, and why you need one! You’ve likely looked into many temperature solutions for your home, but a smart thermostat is one of our favorites. The average household temperature usually hovers somewhere around 21C. Imagine if, instead of coming home to a cold house, it could be at room temperature – or warmer in the winter – when you arrived. A smart thermostat makes that happen. Using an app on your smartphone, or even texting a telephone number with your commands, you can control the temperature in your house wherever you are. It even allows you to, if you’ve got zoned heating, control the upstairs and downstairs of your home separately. Even better? This can be installed anywhere you like in your home, so it’s especially convenient. Imagine if your home heated and cooled on your schedule, and not the other way around. Plus, there are financial benefits. Controlling the temperature of your home while you’re away allows you to save money if you forgot to turn off your system after you left your house. Plus, this will help the furnace to be more efficient. It also ensures that you’ll only use your system when you are at home, saving you serious funds. Some high-tech thermostats will know when you are home or away from home therefore will adjust the schedule accordingly and save you money! Don’t worry – your new thermostat won’t interfere with other wireless electronics already in your home. Mainly, these thermostats rely on sensors, so they can be adjusted according to your schedule and commands. Basically, the temperature is yours to manipulate with the click of a button. Some even operate with batteries – so make sure you have enough on hand to last you through those winter months! Interestingly enough,smart thermostats do actually have wires. It’s the receiver itself that’s completely wireless, and it uses wires that have been coded by color to connect with the wired thermostat. It’s even possible to get this thermostat synched up with other electronic devices in your home, including your lights and home entertainment system. While it is possible to install your smart thermostat yourself, we highly recommend relying on the company you bought the system from to help you safely – and quickly – finish the job. Now that you’ve learned all about the great things these systems offer, we know you’re itching to get your hands on one. To learn more about our services, and how to get a smart thermostat installed with no upfront investment, get additional questions answered, and even to get a free quote, check out our website and feel free to contact us.